NetApp has a broader, deeper and more profitable channel arsenal with a more lucrative backend rebate program than rival Pure Storage – which is more focused on "transactional" front end benefits, says NetApp Americas Channel Chief Jeff McCullough. McCullough said the difference between the two companies is: "Pure is very much focused on how do they pull in the transactional side of the business vs. building a sustaining channel program, a channel business." A top executive for a storage solution provider, who works with both vendors and who did not want to be identified, said the backend rebates have made NetApp a more lucrative partner for the channel. In fact, he said, NetApp's margins are three to four points higher than the Pure margins. What's more, NetApp provides recurring revenue on storage sales through public cloud providers AWS, Microsoft Azure and Google – a big differentiator over Pure, said the executive. "This is monthly recurring revenue," the solution provider said. "Just get the customer set up. You then get a monthly check broken down by customer." NetApp makes two of its cloud-based applications available through public cloud providers, McCullough said. The first, Cloud Volumes Ontap, is the company’s Ontap storage operating system running in a virtual instance on the cloud and is purchased on a capacity basis. It is available through AWS and Microsoft Azure. The second is NetApp Cloud Volumes Services, a speed-optimized storage platform that provides high-performance NFS for enterprises as a service. It is currently available through AWS and Azure, and will be available in a public release for the Google Cloud later this year, he said. “Partners can register deals with us, and they will get paid a 15 percent rebate from NetApp based on Google Sales Reporting,” he said. NetApp is more focused on providing a full range of channel benefits focused on the long-term transition from on-premises to cloud with a broad and deep product line aimed at helping partners grow their storage revenue, McCullough said. "Today, we're accelerating and continuing to grow in flash, but we're in HCI, we're in cloud, we're in near-memory platforms which is our MaxData platform, or StorageGrid object-based, or E-series low-cost capacity-based storage," he said. NetApp is unique among storage vendors in that it offers a large portfolio of products and services to channel partners that over the past few years expanded from storage arrays to now include one of the industry's largest all-flash storage business, cloud-native versions of its products, hyper-converged infrastructure, and NetApp-branded services, said Chris Lamborn, NetApp's senior director of global channel strategy and programs. That leads to cases where partners can earn up to $220,000 in incremental benefits when opening a new customer or making a competitive displacement, depending on how the deal is structured, Lamborn told CRN. "You're going to be earning solid money that you as a partner can determine how to best invest back into your organization," he said. "What we're not doing is saying, it has to go into this space, it has to go into that. This is about enabling partners to accelerate their business in a big way." Lamborn said partners can take a single incentive view like Pure Storage offers, such as a spif, to help partners gain business or they can embrace a "very balanced approach which we're taking, both into the sellers and into the business around the behavioral drivers." Michael Sotnick, vice president of partners, services, and business development at Pure, countered that Pure Storage offers best-in-class front-end margins, and, starting with last year's introduction of its two-tier channel program, is complementing that with back-end benefits for the company's top "elite-plus" partners. The company's back-end benefits are based on partner growth, with incentives aimed at growing into new software and cloud opportunities for clients in particular industries or of a particular size, he said. Pure Storage also offers recurring revenue opportunities as part of its Evergreen program, which makes it easy for partners to sell public cloud subscriptions as part of a hybrid offering, Sotnick said. "Customers can add capacity in a non-disruptive way, and after three years get a controller refresh," he said. "Also, we offer a consumption-based subscription service based on capacity use per month." Pure is 100 percent channel partner-focused, and most recently recorded 33 percent year-over-year growth in sales. "Our growth is our partner growth," he said. Furthermore, Sotnick said, Pure is committed in the future to providing incentives for storage sales for public cloud. “In the near future, Pure will have solutions available through AWS," he said. NetApp's channel program is second to none, said Bret MacInnes, practice director for NetApp at Trace3, an Irvine, Calif.-based solution provider and long-time NetApp channel partner. "If you look at it compared to programs from Cisco and others, it's a much better program, with better training and support," he said. "NetApp really knows how to support us." MacInnes singled out NetApp's partner and channel development managers for helping Trace3 win deals in the sales trenches. Pure Storage, meanwhile, has thrived in the channel in large part because so many channel-savvy former NetApp employees have moved to the company, MacInnes said. "Pure is stepping up with 100 percent lead generation, which is where NetApp was 15 years ago," he said. "NetApp is now big enough that it has wide coverage, and so there are fewer new lead generation opportunities. Pure, as an up-and-comer, has more lead generation opportunities." NetApp, however, is leading in terms of cloud innovation, MacInnes said. "No one else is even close to NetApp in its cloud message," he said. "Pure has a lot of ex-NetApp people, and a good cloud message. I sometimes ask them if they are trying to copy everything NetApp does. But NetApp is light years ahead of where everybody else is." The biggest benefit when working with NetApp is not just helping better execute with customers, but providing partners with "readiness" to grow, said Scott Trinque, president and chief technology officer at EchoStor Technologies, a Hopkinton, Mass.-based solution provider and long-time NetApp channel partner. "NetApp makes sure we're ready with their tech and sales plans so we can align with the company correctly," Trinque told CRN. "It's a 'better together' strategy you just don't get from other manufacturers." NetApp provides margins that in general are among the best in the business, and let partners add value through the entire deal, Trinque said. "Sometimes, other vendors dictate margins to us," he said. "NetApp doesn't, not in the areas where we have established relationships. NetApp knows we're tight with customers, and they're happy to support us. Working with NetApp, EchoStor is seeing margins of over 10 percent on sales through the public cloud vendors, which is better than what the cloud companies offer, Trinque said. "No other storage vendors offer those kind of margins," he said. "I don't even know of any other vendors who even talk about the cloud." NetApp is also leading the storage industry's charge to the cloud from CEO George Kurian down, Trinque said. "NetApp is talking about the need to work with the cloud, and providing partners the technology and services to do it," he said. "Because of NetApp, we formed our AWS alliance, our Azure alliance, and an MSP business around VMware's acquisition of CloudHealth. They showed us where the business is growing, and helped us get in front of it." Trinque also praised NetApp's strong field channel alignment. "We are an extension of their sales force," he said. "Another company might have someone sitting in Texas trying to manage you. But if you are talking with a sales rep in your area, you get faster, more proactive help. Other vendors also may have too many channel people, with a person for every product or business unit, which is confusing, or someone in a remote office but not tied to me." NetApp, on the other hand, has one person in a region, Trinque said. "So if there's an issue, you're assigned a single resource who drives to resolution," he said. "It's in the NetApp culture." 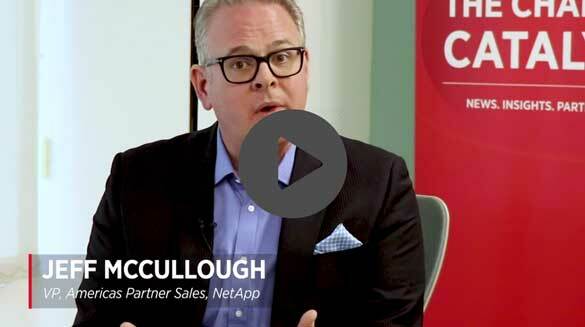 NetApp's portfolio is aimed at helping customers solve four big challenges, McCullough said. The four are how to modernize enterprise applications, how to tackle artificial intelligence, how to migrate and continue to innovate in the cloud, and how to accelerate and grow devops, he said. "Those four areas, for us, is how you're going to see us go to market with our partners, and how we want to go lead the conversations with customers which are going to pull these things through," he said.